The Superior Six are here! 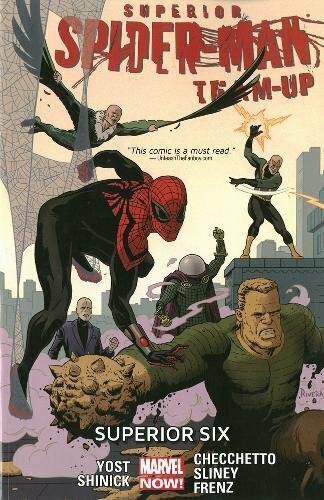 Spider-Man has captured the members of the Sinister Six...and now he has formed them into his own Superior super-hero team! But can Spider-Man trust his new team, aka his greatest enemies, when a reformed Masters of Evil come calling? As everything begins to go wrong, Spider-Man learns that with great arrogance must come great consequences. Now, every single person in New York City might die at the Superior Six's hands...and it's all Spider-Man's fault! Everything has been building to this! Humbled, the Superior Spider-Man must grapple with self-doubt for the first time! Can guest-stars Sub-Mariner, Daredevil, Punisher and Cloak & Dagger help him overcome it? And can any of them help stop the Green Goblin from conquering the New York Underworld in an all-out gang war?